Starting with resolution A/50/173 adopted 22 December 1995, at the same time as the UNESCO General Conference gave priority to a culture of peace, the United Nations General Assembly began considering and adopting resolutions on the culture of peace. The 1995 resolution, as described in the memos from the Director of the New York office of 20 November and 1 December, was proposed by Peru and backed especially by other Latin countries. This resolution - as well as those in subsequent years - was aided by the involvement of Ms Anita Amorim, a UNESCO staff member whose father was the Brazilian ambassador to the UN and formerly Foreign Minister. In 1995 she was working under the Director of the New York Office, Jorge Werthein, who would later become Director of the Brazil office of UNESCO and mobilize that country during the International Year for the Culture of Peace. Then, beginning in 1996, the New York Office was directed by Nina Sibal, who brought to the office a passionate involvement. Ironically, Nina Sibal as a member of the Indian delegation to the UNESCO Executive Board had objected to the proposed resolution for the culture of peace in October 1993. The Director-General later offered her the key position of the Director's post of the UNESCO office at the United Nations. Then, it was Ms Sibal, in the name of the non-aligned movement, who became the major proponent of the culture of peace at the United Nations in New York and played an important role in the formulation and informal lobbying for the culture of peace resolutions of the General Assembly. A key moment was the adoption 12 December 1996 by the General Assembly of resolution A/51/101 requesting UNESCO to prepare and submit "elements for a draft provisional declaration and programme of action on a culture of peace" for its 52nd session in the fall of 1997. The 1996 resolution was based on the 1995 resolution A/50/173 that had requested a report but not a declaration and programme of action. The major point of contention among the Member States during the debate from 25-27 November was whether the culture of peace should be considered as an agenda item in itself or as part of the debate on human rights. 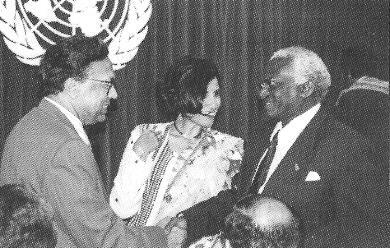 The Year 1997 was to be the most important year in the development of UN initiatives. Three separate initiatives would converge: the proposal for the International Year for the Culture of Peace (2000); the proposal for the UN Declaration and Programme of Action on a Culture of Peace; and the initiative of the Nobel Peace Laureates "Campaign for the Children of the World" that would eventually become the International Decade for a Culture of Peace and Non-Violence for the Children of the World (2001-2010). These initiatives are considered separately in the following pages.